HOW TO MAKE Kulche Chole ? Soak the matar overnight or for 5-6 hours. Drain them and wash with fresh water and boil them. Sauté it for 2 minutes. Add boiled matar and mix them. Add 1 tsp red chili powder, 1 tsp coriander powder, 1 tsp garam masala, 1/2 tsp turmeric powder, salt (to taste) to the pan and simmer for 4-5 minutes. Take a bowl add grind tamarind, 1/2 tsp cumin powder, black salt, 1/2 tsp chat masala, 3/4 tsp dry mango powder. Add 1/2 packet of jaljeera. Add water to it and mix it well. Add chopped onion, tomatoes and green chili. Add it to the pan and mix them. Simmer it for 5-6 minutes. Take a bowl and matar curry to it. Add 1/2 tsp lemon juice and garnish it with coriander leaves and green chilies. Now heat a tawa and add flatten kulcha to it. Cook the kulcha until it gets golden spots on both sides. When cooked, turn off the flame. 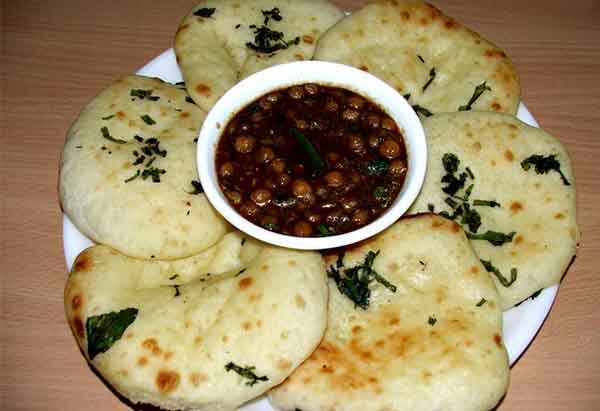 Serve hot kulcha with spicy matar. Preparation For Chole : Take 3 cup matar and soak it overnight or for 5-6 hours. You can also add 3/ tsp of baking soda to it. At morning, drain the matar and wash 2-3 times with fresh water. Now take a pressure cooker and add 2 glass of water to it. Add matar to pressure cooker and boil them. Chop 3 onions, 2 tomatoes, coriander leaves and 4-5 green chilies finely. Take 3-4 tamarind and remove seeds. Grind tamarind and keep it aside until required. How To Cook Chole : Take a pan and add 2 tbsp oil/clarified butter to it. Heat it and add 2 bay leaves to it. Add cardamom, 1 tsp cumin seeds, 1 tsp fennel seeds and 1/4 tsp asafoetida to the pan. Allow them to sizzle. Now add grated or finely chopped ginger to it and sauté it for 3-4 minutes. Stir it. Now add boiled matar to the pan. Give a stir. Now Add spices to it. Add 1 tsp red chili powder, 1 tsp coriander powder, 1 tsp garam masala, 1/2 tsp turmeric powder, salt (to taste) to the pan. I prefer black salt as it gives a unique taste. Mix it thoroughly. And simmer it for 5-6 minutes. Add small amount of water if needed. How To Make Tamarind Topping : Meanwhile, Take a bowl and add grind tamarind to it. Now add spices to it. Add 1/2 tsp cumin powder, black salt (to taste), 1/2 tsp chat masala, 3/4 tsp dry mango powder to it. Now add 1/2 packet or 3 tsp of jaljeera to it. Add little water to it and mix it well. Now add finely chopped onions, tomatoes and green chilies to it. Mix it well. ( If you want, add finely chopped onion, tomatoes and green chilies to the pan before adding matar. Instead of adding in tamarind topping). Now add the topping to the pan and sauté for 4-5 minutes. Spicy matar curry is ready now. Prepare Dough For Kulcha : In a big bowl, take Maida flour (Fine Flour) and pour 2 tsp of Ghee/refined/Clarified Butter in it. Mix it gently. Add 1 cup of yogurt to it. To make it softer, add some water and knead it. To avoid lumps knead it with warm water. Rub it with your fingers and palm until the dough becomes soft. When the Dough is ready, cover it with damp cloth and keep it aside for 15-20 minutes. Make Balls From Dough : Now make balls from dough and flatten each ball with the rolling pin into small sized kulcha. How To Cook Kulcha : Take a tawa and heat it. Now take a kulcha and place it on tawa. Let it cook form one side. Now flip the kulcha and apply clarified butter/oil on it. Again, flip it and apply clarified butter/oil on the other side also. Cook the kulcha until it gets golden spots on both sides. You can also add finely chopped and sautéed onion, tomato and coriander leave to the kulcha while cooking. Garnishing : Now add hot spicy matar curry to a bowl. Add 1/2 tsp of lemon juice to it and mix it well. Add finely chopped onions, coriander leaves and green chilies to it. Serve it with hot kulcha. Go for Chole Bhature also. Use non-stick tawa for kulche. If you do not have jaljeera, increase the amount of chat masala, black salt and add 1/2 tsp black pepper powder.